Instead of buying a $20 + corsage for just a couple of hours on Halloween for my 80's prom costume, my mother decided to teach me how to make one from scratch and at half the cost! In her young twenties, my mother worked as a florist and her main task was to make corsages, and in peak dance seasons, she made hundreds! Even though it's been years since she last designed one, it came right back to her like riding a bike. And young Ladies out there... Winter Formal is coming up, so this is a great way to save some extra cash and have a fun afternoon with Mom. Fold down the wires so that they are parallel with the flower, acting as its new stem. With the floral tape, wrap it around the base of the flower and wire. Arrange your flowers. Have a couple facing one way and the rest facing the other way. Once arranged bind them together with the floral tape. Since the wires are all now in different directions, fold them back so that they are all facing the same direction. Create a bow with your ribbon and tie it around the middle of the piece. Leave the ends long enough to tie around the wrist. Bind the wires together with floral tape and trim off the access. Fold in the wire to avoid getting tetanus at the event! ;) For a more secure fit, you could tie another ribbon at the end of the piece so you'll have 2 ribbons wrapped around the wrist to avoid flopping. 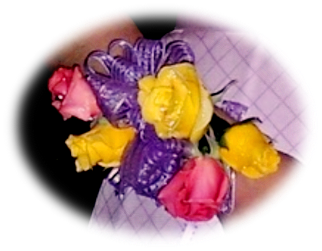 If making the corsage the night before, spray the flowers with water, put in a plastic bag and stick it in the fridge. This helps keep the corsage looking fresh for the next day's dance/event. Tie the excess ribbon around the wrist and Ta-Da, you got yourself a pretty accessory for a fancy night. Keep in mind the one shown here was given an 80's flare. Just update your flowers and ribbon for a more modern look!